Can Friendship Mix With Business? I hope so… THE COMPANY may hold the answer. I have a confession of sorts… a long, long time ago (the mid 1970’s to be honest) I managed a Christian Bookshop owned by Tyndale House Publishers in the western suburbs of Chicago. It was my first job out of college and I absolutely loved it. During my short 4 year career from May 1976 to July 1980 we learned quite a bit about selling Books, Bibles and Christian Music. I think in 1979 I was interviewed by Contemporary Christian Music magazine to share my views about the burgeoning Christian Music market. All I remember was that Noel Paul Stookey of Peter, Paul and Mary was on the cover and the word “burgeoning” was in the article title. I think John Styll, the publisher had heard about me from friends at Word or Sparrow Records. I’ve certainly been blessed with solid business relationships through the years and many from my Christian Bookselling days have lasted for decades. I read the pdf pages on our laptop in just two days because I simply could not put it down. I heartily recommend it for anyone over age 12 because it is a very, very good read. My taste in books are usually non-fiction because I like to learn from others and benefit from their wisdom. After all, they made the mistakes and lived to tell about it. (So I don’t have to repeat them.) Plus, I’m kind of a curious guy who likes discovering the roots of everything that interests me. So for me to be personally enthralled by a fiction book means it must be both stunning, and spectacular. THE COMPANY is all that and more. I can’t wait to see the movie(s) because Chuck has 4 more sequels planned out in order to finish telling the story. At bare minimum, the story of THE COMPANY is a real conversation starter. However, it would be unfair to divulge any more about THE COMPANY in this blog, but Chuck will tell you more if you listen to the podcast of the interview we did in July at the International Christian Retailing Show in Orlando. 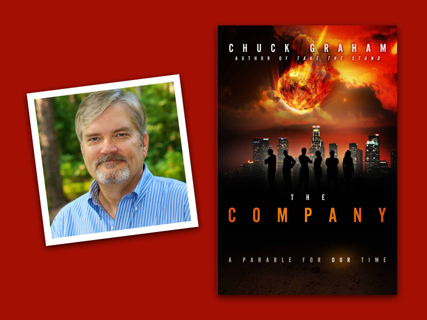 Just visit http://www.sntradio.com/podcasts and click on the highlighted link for Chuck Graham THE COMPANY. After you do, if you are a fiction lover then you will probably put it on your must read list. And I hope that you will appreciate the unique opportunity THE COMPANY has as a gift this Holiday season for all your friends and colleagues. It makes an awesome “secret Santa” gift at your workplace. I may have taken some lines to get to it, but the reason you’re reading this blog is to discover if friendship can mix with business. From my experience, doing business with friends can either be the best experience with stratospheric highs or the absolute worst where a perfectly good friendship gets ruined beyond repair. In the fall of 2010, a friend and former client (I produced and edited his weekly radio program) asked me to be a partner in a new downtown parking garage venture where the after tax profits would go to start a new church in Central Florida. Throwing caution to the wind despite my wife’s advice, I plunged ahead with the task of negotiating contracts, many meetings with city officials about signage, business licenses, setting up the relationships with business insurance, legal, accounting, and payroll professionals and being a paid advisor for setting all significant company policy. I believe the initial meeting was early September of 2010 and operations began in mid-December. Despite the business turning a profit from the very first month, I was bought out in mid-April 2011 and the other party and I had a serious breakdown that lasted into March of this year when we finally began speaking to each other again. The overall business dissolved after about 11 months because the main contract was cancelled under suspicious circumstances. But that does not mean I won’t help a friend, I just will refuse payment for it now in the vast majority of cases. Even if it personally profits my friend substantially. Will a true friend really expect a referral fee for suggesting a service or prospective business customer to another friend. I understand about protocol and professional courtesy in modern business practice but does that have any place in the Body of Christ where we are called to “love one another” and “serve”? There’s a particular verse about laying down your life for a friend. I don’t believe that it means only physically dying any more than “dying to self” does. It has to do with investing yourself in them and their life at the cost of your time, talent, treasure and personal will. Jesus didn’t charge us for anything that He did on earth. No, rather He admonished us, “Lay up treasures in Heaven”. So as opportunities to serve with your friends come in life, please learn from my mistakes so that you don’t have to repeat them. The pain of losing any good relationship is not worth any amount of money. You’ll only get 3 to 5 truly good friends in a lifetime. Don’t roll the dice unless you have very good and non-financial reasons to do so, even if you are qualified to do the work. Now for the rest of the story… this began innocently when Chuck asked me to submit a quote about “THE COMPANY” that could be used for marketing purposes which I did gladly. Because of my experience in that field, I had a pretty good idea of the kind of statement that would be most effective and the manner in which it could be used. As it turned out, WinePress the publishing/marketing company, chose it to be used on a bookmark to be given away at the ICRS mentioned above, an event where 5,000 people from all over the world directly involved in the making and distribution of Christian products meet. Honestly, that was an honor and gift straight from the hand of God. Are people who received the bookmark going to listen to SnT Radio.com? Perhaps. More than anything, it lends credibility to my role as an influence and will register with industry insiders who pay attention to such details. So in my mind, Chuck has already paid it forward and anything I can do to help him get a leg up in the book and film world is only my attempt to balance the books between friends. Even though he’s graciously extended an expanded opportunity to me, all my publishing and film contacts are open and gratis for the advancement of THE COMPANY by Chuck Graham, a man I am pleased to have as my friend, and dear brother in Christ. I intend to keep it that way. BTW, this book and film franchise will accomplish everything that is prophesied on the bookmark. You saw it here first. Click on the link below to see the bookmark but you may need to shrink it in your browser as it may load in large.